Volvo XC40: All You Expected and More! Have you looked at the new Volvo's at Volvo Cars Cincinnati East lately? Volvo has continued their tradition of building solid, dependable vehicles, and raised the bar with the new Volvo XC40. 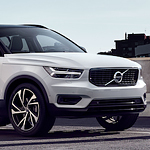 Showcasing Volvo's superior attention to detail, the Volvo XC40 is a Compact Crossover SUV that will make you look good driving around Cincinnati, while also providing exterior features that you may not have expected. Loaded with stylish modern features, the Volvo XC40 includes Heated Windshield Wiper Blades that help to prevent ice and snow build-up on your windshield during colder weather. The calibrated heating elements help keep the heat moving through the windshield wiper for consistent operation. The XC40 also features a Headlight High Pressure Cleaning system that helps keep the headlights clean, providing you with better headlight visibility while driving. These are just a couple of the new exterior features that are included in the Volvo XC40. You might just find that the Volvo XC40 is more than you were expecting of a Volvo.